John was a man who was known as the disciple of love. When John would say something as simple as “Jesus loves you,” it would basically embody an entire sermon. John is known as simple man that said simple yet very profound things. The way that John communicates is similar to drinking a perfect cup of coffee. When we only think of coffee as something that’s good to drink, we don’t realize how much work is behind just one cup. When we discover that the beans were handpicked in Ethiopia and traded through a dozen channels to arrive at our favorite shop, we begin to see what kind of depth one cup actually represents. Similarly, we can get great joy out of John’s seemingly simple words. But when we understand where it comes from, we have an even greater appreciation. John gives us the joy of simplicity with a hidden depth that will continually give us a greater understanding. When we come to the book of First John, this truth is exceedingly true. John says simple yet very profound ideas, but trying to understand them will take a lifetime. So then, what’s the book of I John about? The book of first John is essentially a letter describing how Christ brings us into the light and causes us to walk in it by following the command to believe and to love one another. There is a peculiar phrase at the end of the book that reads: “Little Children, keep yourselves from idols. 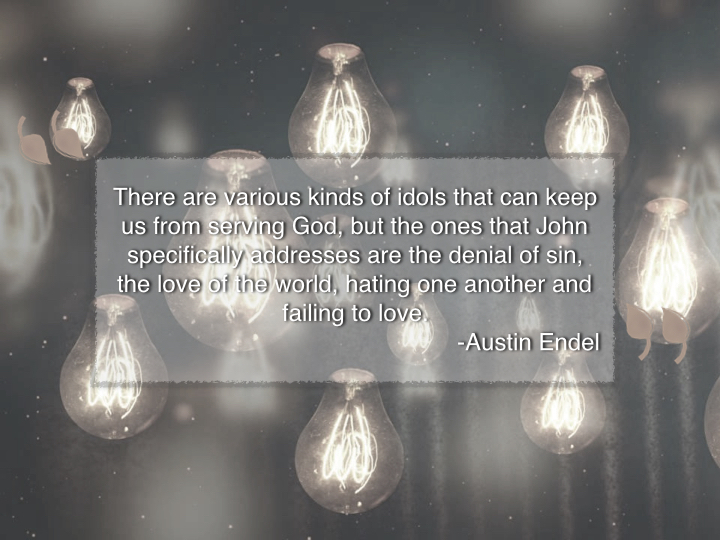 It is as if John wishes to tell his children in the faith various ways to avoid idolatry. When we miss that we can serve the only true God, the one who created us and loved us, and worship Him alone, we miss out on the most important part of human existence, that is worshipping God instead of worshipping idols. There are various kinds of idols that can keep us from serving God, but the ones that John specifically addresses are the denial of sin, the love of the world, hating one another and failing to love. John will lay out these problems and break down their solutions as he continues through the book. All of these examples are of great value, both in John’s day and our own. The first problem that John brings up is the denial of sin in verses 1:8 and 10. This problem is introduced in the context of pointing out the message of Christ is that God is light and in Him there is no darkness. If we walk in the light and not in the dark, then Christ cleanses us. In other words, if we serve God and not idols, then God will always forgive us. That is why later on John will point out that Jesus is our advocate when we sin. Even though we are not perfect, nor will we ever be, God forgives us of our sins when we believe in Him. So if we have this problem, what is the solution that John gives us? He tells us that if we confess our sins to God then He is faithful and just to forgive our sins and to cleanse us from all unrighteousness. Think about it this way. If I am prone to serve an idol in the area of finances, I do things like not giving my money freely to God, buying useless gadgets that distract me from the work of the kingdom or perhaps even stealing in order to obtain something that gives me status. But, if I stop and confess to God that I am not perfect and confess that I should give my finances to Him, then I am no longer serving my own desires. We take our sins and confess them to God because it refocuses our attention on Him. Confessing our sins works against serving an idol because we have to admit that we were wrong and that God was and will continue to be right about what He says. Therefore, since our problem is idolatry, certainly part of our solution is confession to God, in order that we may walk in the light. As we walk through the book of First John, we will see some solutions that John gives us so that we can avoid idolatry in order to truly worship Him. If we can actively work out these solutions that John gives to us when can truly start to walk with God. Walking with God is the purest joy that mankind can experience, because man was made to walk with God. In this series, John’s advice will be made evident so that you may know more about what it means to walk with God and avoid the pitfalls that so easily entangle mankind.